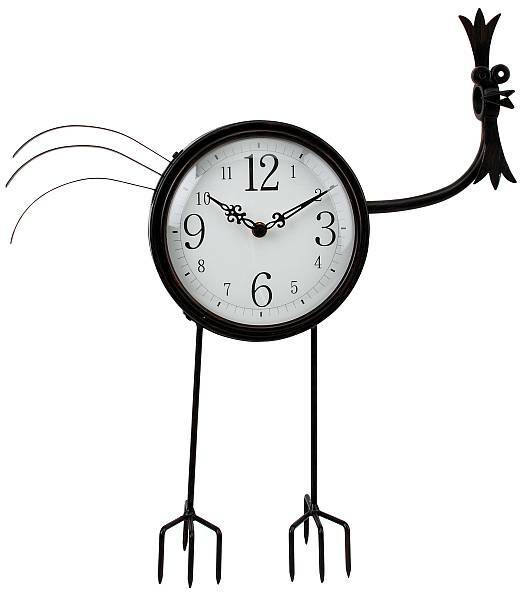 Bring a little whimsy and fun to your garden or yard with this Chicken Design Outdoor Clock by DuroCraft. This charming Clock is rated for indoor and outdoor use and runs on 1- "AA" battery. The Chicken Clock measures 20 Inches High and 17 Inches Wide. The frame is a Cast Aluminum construction with your choice of an Autumn Brown or Antique White Finish. The face of the clock features easy to read Arabic numerals on a white background. Comes with a 2 year warranty on mechanisms and a 1 year warranty on the finish. Please select your preferred color when ordering.